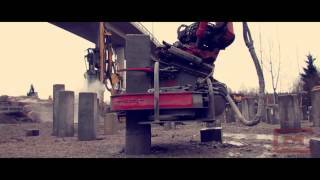 MotoCut Pile Cutter can be attached to any min 5 tn excavator from where it gets the hydraulic power. It operates with two fast rotating diamond blades. The cutting device is manoeuvered from the cabin of the excavator thus there is no need to hazardous hand work nearby the pile. The MotoCut Pile Cutter replaces manual labour in physically heavy pile cutting work, making the job even five times faster and most importantly with minimized risk of accidents – SAFETY FIRST!